An alarming percentage of the world’s shorebird species are declining. Whimbrel populations using the Western Atlantic Flyway have experienced steep declines of around 4% per year since at least the mid-1990s. Moving the balance sheet of births and deaths from the red column to the black column is a fundamental objective of population recovery and management. 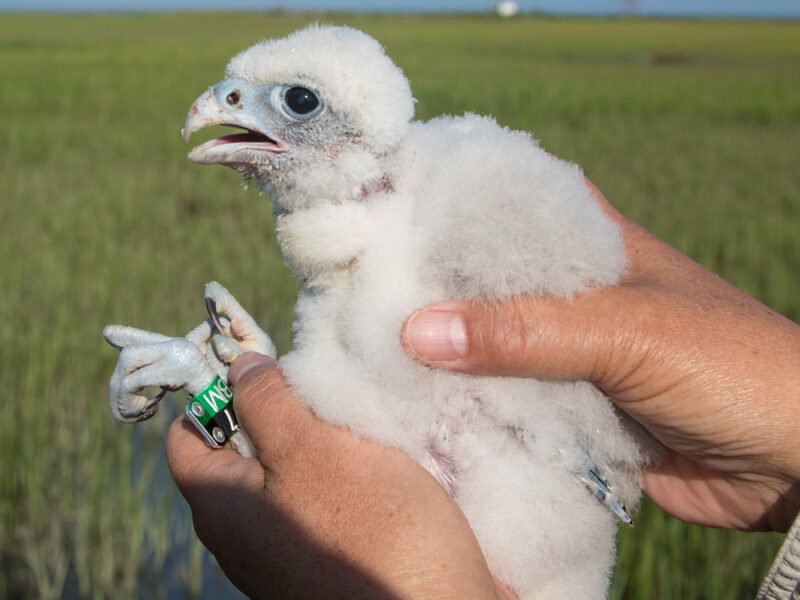 But for species that range over vast areas and spend their time in remote locations, the essential questions of just how far in the red they are or when, where, and how mortality is occurring are very difficult to address. 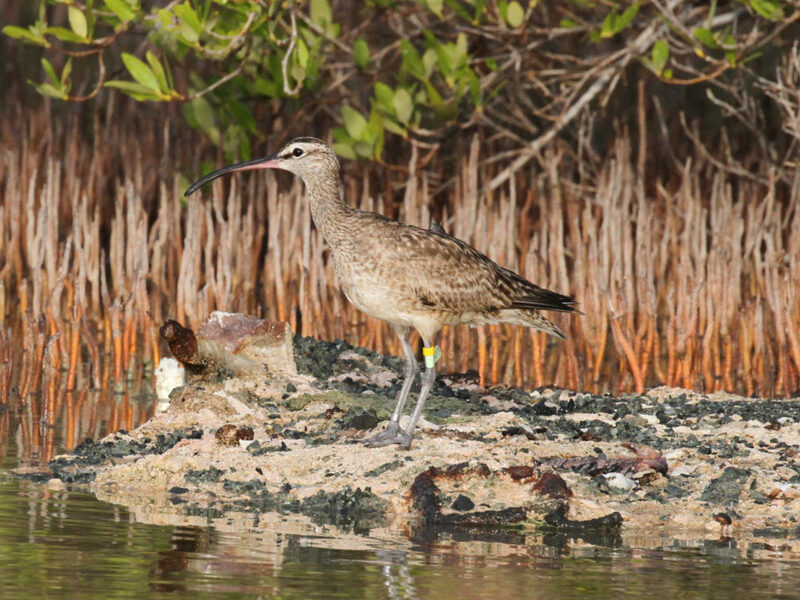 Recently Center for Conservation Biology biologists, along with a long list of partners, published a paper entitled “Seasonal variation in mortality rates for whimbrels using the Western Atlantic Flyway.” The study used 33 satellite-tracked adults to estimate annual mortality and to determine seasonal and geographic bottlenecks in survival. Findings suggest a wide gap between current survival and that believed to be required for population stability, and that the greatest bottleneck in survival occurs during second half of fall migration through early winter in areas where shorebird hunting is still prevalent. 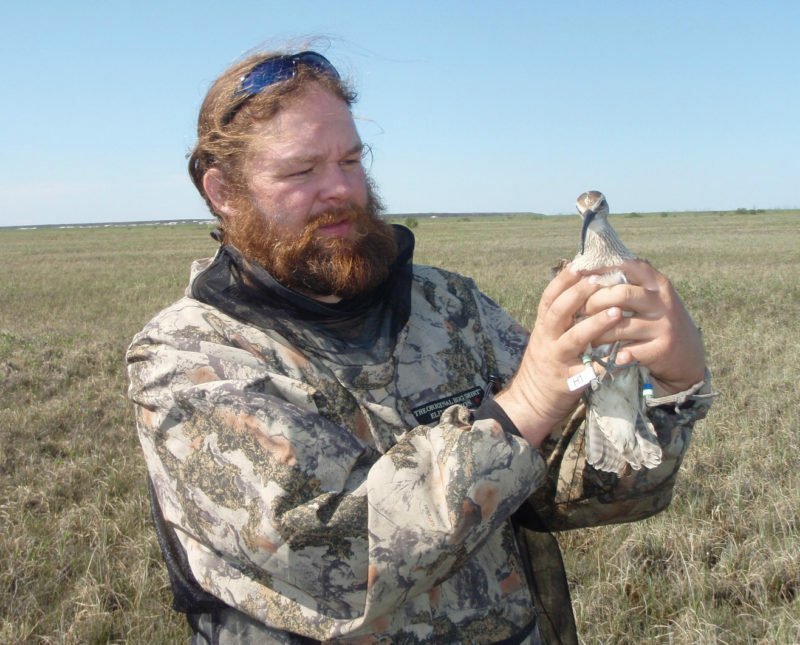 Fletcher Smith with a whimbrel captured on the breeding grounds along the Mackenzie River in western Canada. 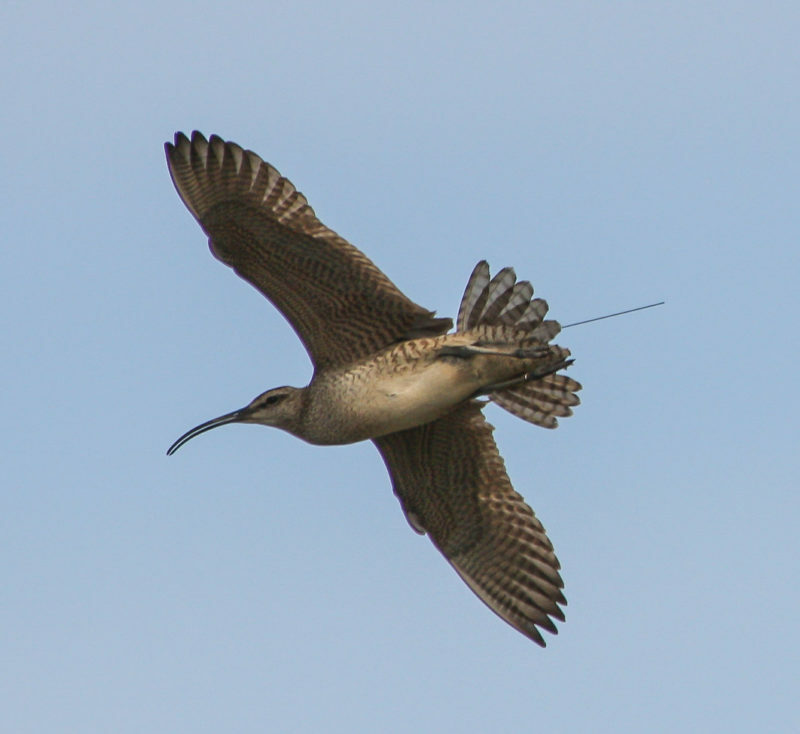 The Mackenzie River was one of the locations where whimbrel were fitted with satellite transmitters for tracking. CCB photo. 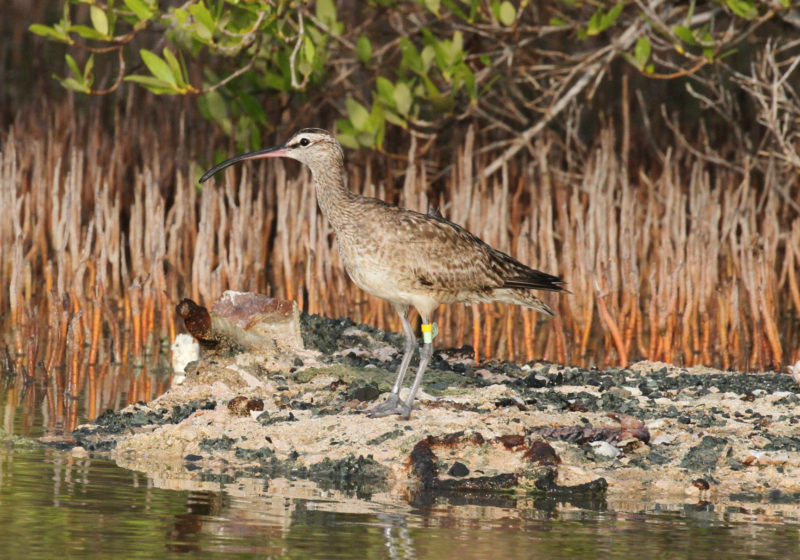 The 33 adult whimbrels were tracked throughout the annual cycle, including 12,800 bird days and tens of thousands of kilometers. The study estimated a dismal average annual survival of only 0.54 compared to the “break-even” rate believed to fall between 0.8 and 0.9 for these populations. Daily hazard rates were more than five times higher during the migratory periods compared to summer and winter. 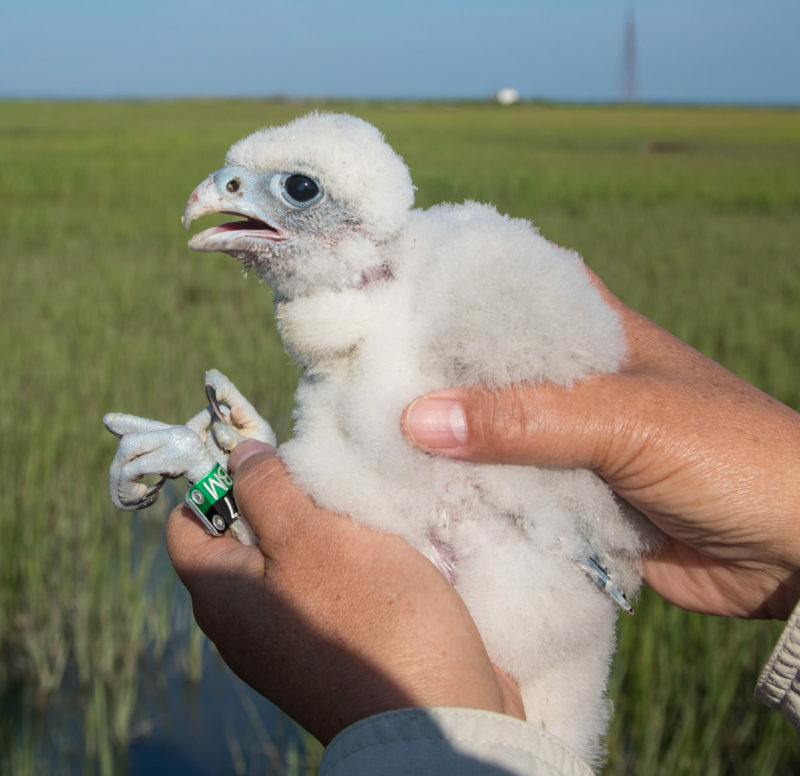 More than half of the total mortality occurred between late July and early November during fall migration. Two clusters of mortality were identified, including the highest concentration along the northern coast of South America from Guyana to Brazil and a second cluster within the islands of the Caribbean Basin. 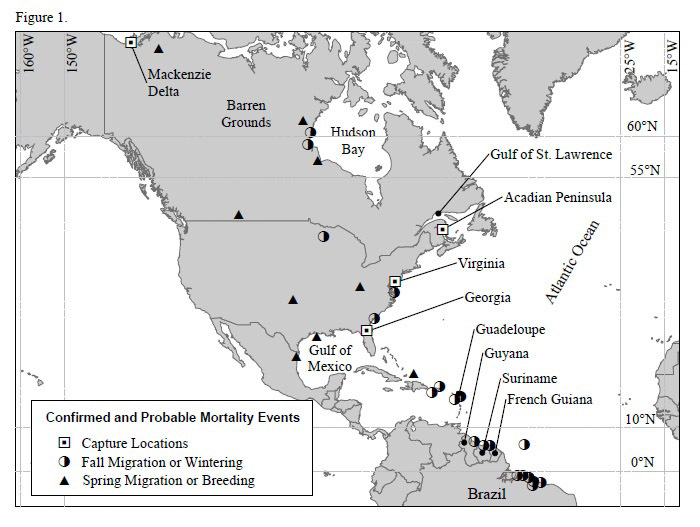 Mortality events during spring migration were more scattered. 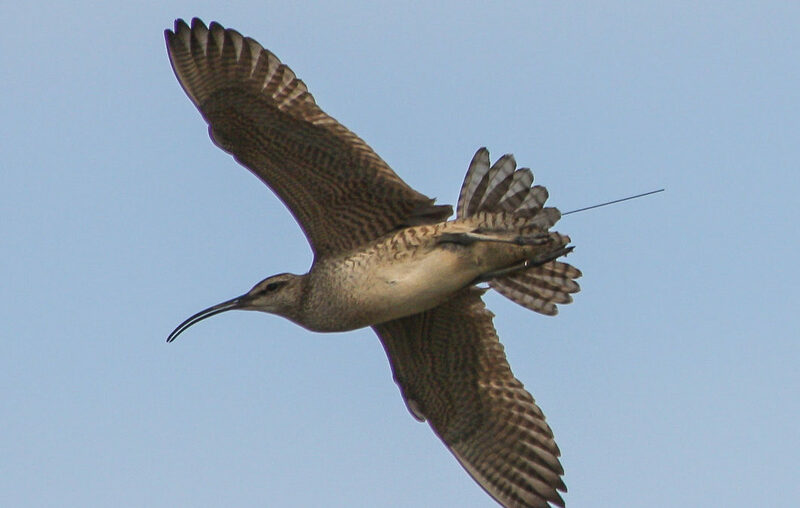 Locations where whimbrels were initially captured and fitted with satellite transmitters and locations of subsequent confirmed or probable mortality events. Half-shaded circles denote events that occurred during fall migration and winter; filled triangles denote events that occurred during spring migration or breeding. Data from CCB. 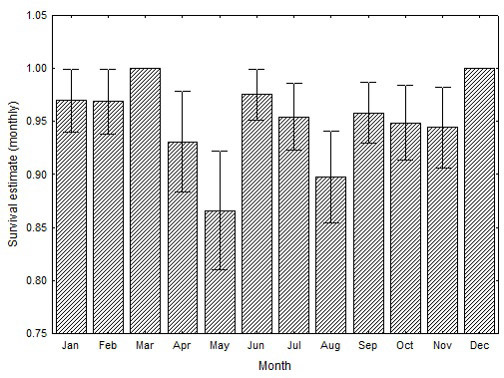 Monthly Kaplan-Meier survival estimates for whimbrels tracked with satellite transmitters throughout the Western Atlantic Flyway. Data from CCB. More than 60% of the fall and winter mortality occurred where both legal and illegal hunting activity is currently concentrated and during the peak time of the hunting season, suggesting a link between hunting activities and recent shorebird declines throughout the Flyway. 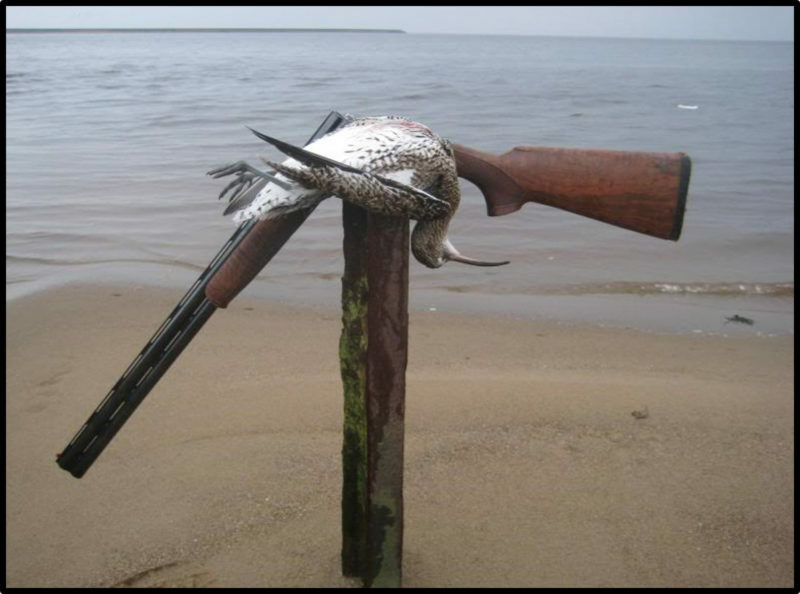 Although hunting continues to occur within a relatively small geographic region, the area included is very significant to shorebirds using the Flyway. 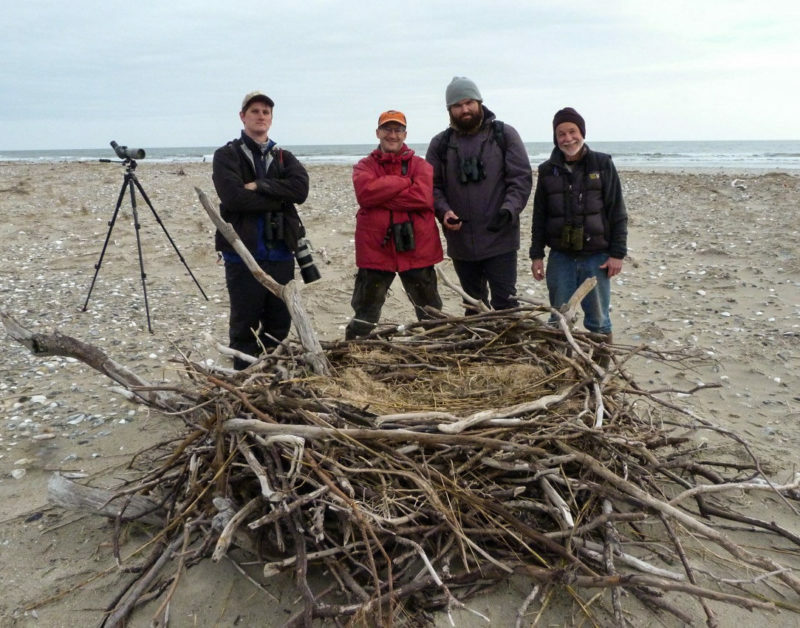 Since an initial symposium on shorebird hunting was held during the fall of 2011, an international coalition has been focused on strategic tasks including quantifying sustainable harvest levels, assessing current policies, estimating current harvest levels within key geographic areas, and strengthening enforcement of existing laws. 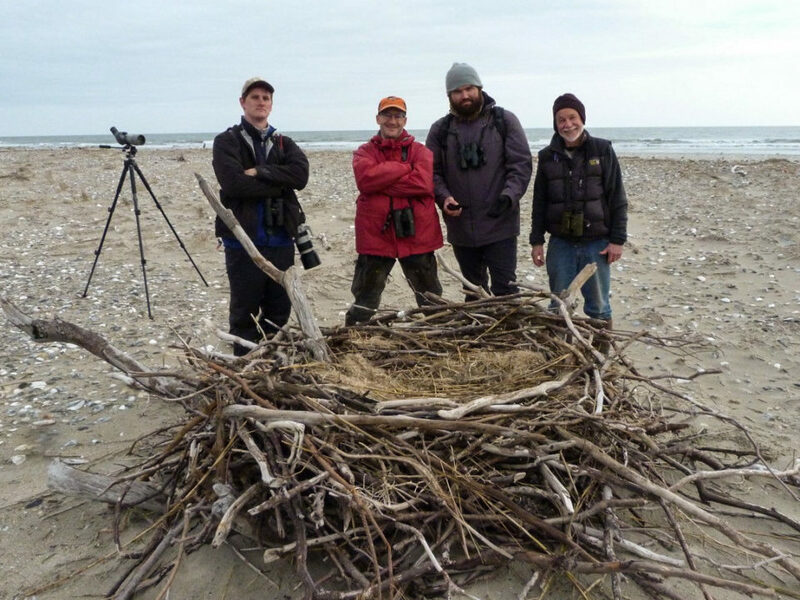 The success of this coalition may determine the future of several shorebird populations that depend on the Flyway. Whimbrel shot by a hunter during migration. Hunting has emerged as one factor likely contributing to recent population declines. Photo anonymous.